Our Parent and Toddler – Water babies session takes place in Sunmarke school on Saturdays at 1 PM with coach Mrs Gerrie van Beek . Babies from the age of 6 month are welcome to join, one parent must be in the water with the child. The next course will run from Saturday 20th April until Saturday 29th June. Fee for this course is AED 850, single class AED 125. Enter into the wonderful world of Baby Swimming ! With our program specially designed to give babies the very best introduction to the water. Every baby is born a perfect swimmer, having lived suspended in fluid in the womb for nine months. The difference between swimming in the womb and in water after birth is the need to breathe. An early introduction to swimming encourages your baby to relax and enjoy being in water, and also aids the development of balance, co-ordination and strength. Through a series of activities & familiar songs the little ones are taught the first steps in kicking & moving through the water. Classes involve a parent being in the water with their baby and the aim is to encourage children to not feel scared, to relax & enjoy the water. It is also a great bonding experience for parent and child. The lessons are full of fun and are a good chance to meet other parents! 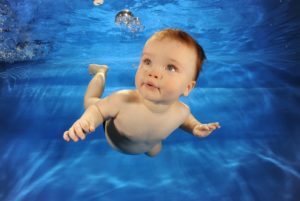 No two children develop at the same rate or in exactly the same way, but most Water Babies will be swimming by the time they are approximately two years old. By the time the child reaches 3 years of age and they are old enough to start Swimming lessons they should be confident enough and already have the basic skills to learn to swim.